Twitter, the micro-blogging website is rolling out a new version of its Android app for few selective users, which revamps the look of the app with Material Design. So, you see a much cleaner and intuitive interface on the Android app. It has been demanded by users that Twitter app for Android has been missing a minimalistic look. The real-time social networking service has started to roll out the much-awaited update to its Indian audience. Earlier, the company has rolled out a beta update 6.0 version to its users in the United States, which saw a positive feedback from the number of users. Though, do make a note that this app is only available for users who have opted for the beta testing the Android app. Now if you’re wondering how you can get this update on your device? Well, it was recently that Google has changed the policy for the beta app testers. Before, the developers would have to create a group for beta testing and individually approve them for beta testing the app. But after Google Play Store app’s recent update to 6.6.12 version, users can directly opt in or leave the beta testing from within the app. With Google promised a ton of new features and improvement in Beta testing for developers, which was announced at Google I/O 2016, users can hope to get a better experience. Talking about the improvements in the new Twitter beta app for Android you can see that main navigation is finally in line with what’s Google defines in the Material Design. That is, a large navigation space with a label for Home, Notification and Direct Messages. Note that Indian users will be seeing only those three tabs, while if you’re in the United States on the beta app, there would an extra tab for Moments. It’s a feature that is only available for US audience. Currently, the stable version of the Twitter Android app is at 5.111.0 on the play store, while if you’re a beta tester, you can expect the 6.0.0-beta to be rolled out to you soon. The first and foremost thing that we noticed about the new UI is that the twitter logo, find user and settings have been moved from the above navigation bar. While instead of the logo, you see a home button as the first tab. Moreover, there is now a sliding navigation menu, which opens once you swipe from the left. There you can access the profile, highlights, lists and connect with other users. It also makes easier to switch between accounts. There also a floating button, which crams the whole bar you see on the below in current stable version. Tapping on that will open a tweet box, and then you can write, add image, gif, poll, etc. You must be familiar with Google apps like Gmail, Maps, etc. 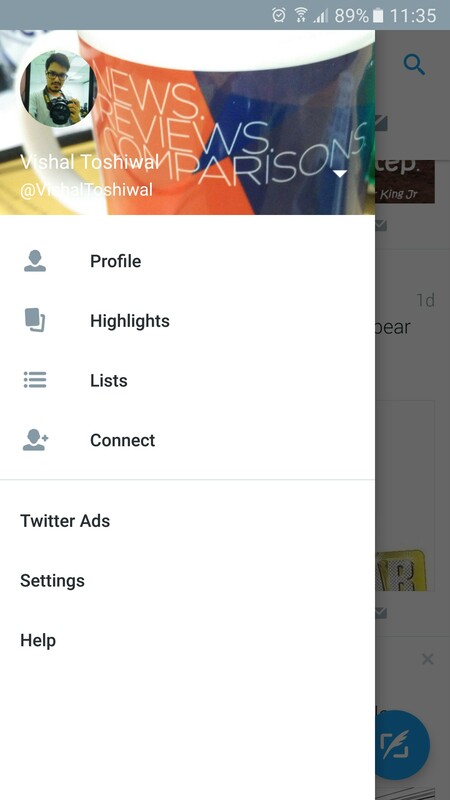 The new Twitter app features the same navigation style, which is in fact called the Material Design. It took a lot of time to Twitter to launch a working app using Material design language. It is one of the largest social networks of time to switch to this design language that has been for around two years now, as it was announced at Google I/O 2014 Developer Conferences. Now we are hoping to see this update go public soon.